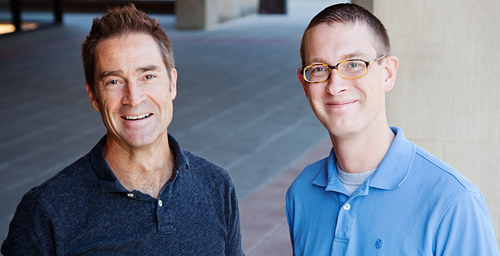 A new study by University of Illinois psychology professor Brent Roberts, left, and postdoctoral researcher Patrick Hill suggests that narcissism can be useful in early but not late life. CHAMPAIGN, lll. - We all know one, or think we do: the person whose self-regard seems out of proportion to his or her actual merits. Popular culture labels these folks "narcissists," almost always a derogatory term. But a new study suggests that some forms of narcissism are - at least in the short term - beneficial, helping children navigate the difficult transition to adulthood. The study appears in the journal Social Psychological and Personality Science. "Most people think of narcissism as a trait that doesn't change much across the lifespan," said postdoctoral researcher Patrick Hill, who conducted the study with University of Illinois psychology professor Brent Roberts. "But a lot of recent studies have shown that the developmental trajectory of narcissism goes upward in adolescence and what we call emerging adulthood - the late teens and early 20s, and then typically declines." This reduction in narcissistic traits coincides with a decline in their usefulness, the researchers found. "We looked at three different forms of narcissism," Hill said. The first, an inflated sense of leadership or authority, is the belief "that you know a lot and people should come to you for advice," he said. The second is "grandiose exhibitionism," being pompous, wanting to show off, and having an exaggerated sense of one's capabilities and talents. The third is a sense of entitlement and a willingness to exploit others for personal gain. In the study, young people who were high in the leadership and grandiose exhibitionism forms of narcissism were likely to report higher life satisfaction and well-being, while mothers who had the same traits were not. A sense of entitlement or willingness to exploit others for personal gain predicted lower life satisfaction at every age, however. In general, participants had a lower opinion of those with narcissistic traits. Narcissistic mothers, in particular, tended to be viewed as neurotic and low in conscientiousness, the researchers found. Students who were narcissistic were not generally judged to be neurotic, but they and their narcissistic mothers were more likely to be viewed as low in "agreeableness." These negative judgments, particularly of older adults, "could have quite interesting negative ramifications for people's circumstances in middle and old age if they retain this rather grandiose sense of self," Roberts said. "This study continues a line of research that shows that there is a fundamental developmental shift in both the amounts of narcissism that people have and also in the meaning of it as people age," Roberts said. An exaggerated belief in one's own capabilities and prospects may help young people "navigate adolescence and the turmoil involved in trying to find a sense of identity," he said. Later in life, however, those same traits "appear to be related to less life satisfaction and a poorer reputation." Editor's note: To contact Brent Roberts, call: 217-333-2644; email: bwrobrts@illinois.edu. The paper, “Narcissism, Well-Being, and Observer-Rated Personality Across the Lifespan,” is available online (pdf).